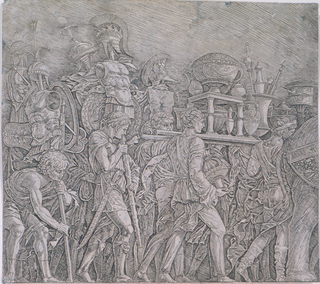 A triumphal procession of Roman soldiers carrying trophies. The spoils, including armor, furniture, drinking vessels, and other objects made of precious metals are loaded onto stretchers, pole, and spears. The figures are depicted walking left-to-right, as on Roman and Greek architectural reliefs.